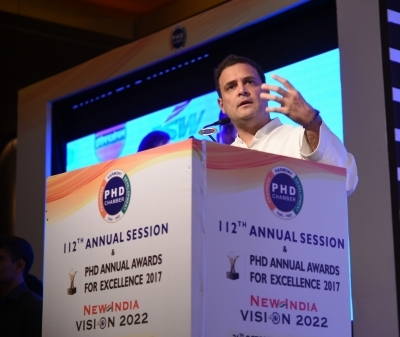 New Delhi, Oct 26 (IANS) Congress Vice President Rahul Gandhi on Thursday accused the Modi government of using Aadhaar as a “monitoring mechanism” and said it will end up in the same “mess” as the Goods and Services Tax (GST). 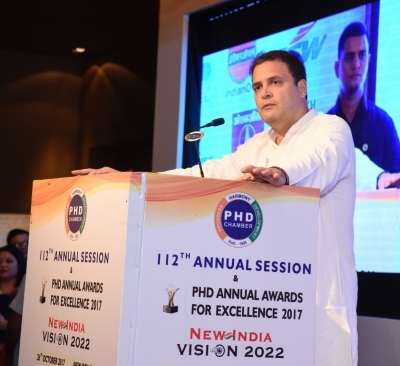 Speaking at the valedictory session of the 122th annual session of PHD Chamber of Commerce and Industry, Gandhi also said that GST needs to be “reformed, changed and simplified”. Answering a query on the directives to link Aadhaar with bank accounts and sim cards, Gandhi said the Aadhaar programme, which was initiated by the Congress-led UPA government, was designed to be a supporting mechanism and not a monitoring mechanism. “The forces in power today are converting it into monitoring mechanism. That’s how they visualise Aadhaar. That is not how it was intended. And I agree with you (the questioner) that it is going to have serious consequences,” Gandhi said. “So you will end up in the same mess that you are now with the GST. You will attempt to do something that is not feasible, and then you will get stuck,” he added. The Central government had on Wednesday told the Supreme Court that it will extend till March 31, 2018, the deadline for linking Aadhaar with bank accounts, PAN, mobile numbers and other schemes for those who don’t have the unique identification number and are willing to go for it. On GST, Gandhi said it has gone “wrong” and the government was not listening to the people. “We fought a very brave battle to get India GST which is very good. The basic architecture was minimum slabs, a cap on amount of tax and simple GST. We gave it everything we had,” Gandhi said. He said party leader P. Chidambaram went to meet Finance Minister Arun Jaitley to convey that the government was making a “mistake” with GST and later to say that the tax should first be implemented on pilot basis, but the party’s concerns were overlooked and it was almost told to “mind your business”. He said there were 5-6 slabs, the upper tax slab of 28 per cent should be capped at 18 per cent. “Now that the GST has been implemented the government will not accept changes but we will apply pressure and are doing it. But our position is that GST has to be reformed, changed and simplified,” he said.